Cancer accessories includes Hats, wigs, scarves and chemo capes, etc. Cancer treatments such as chemotherapy often result in hair loss and contribute to the emotional turmoil of a cancer journey. H.O.P.E. can help bring confidence back to the cancer patient by providing a fitting session for cancer accessories. Patients may choose from a wide selection of wigs, hats, scarves, and turbans to find the right fit for their personal comfort and style. Head forms, conditioners, and grooming tools are provided with a patient’s wig selection. 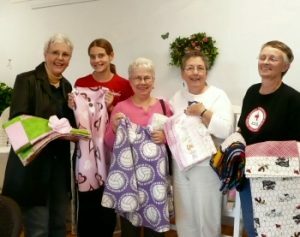 Wrapped With Love Program gives cancer patients comfort. Patients can “wrap themselves with love” with H.O.P.E.’s hand-made blankets, pillows, chemo capes, walker bags, and catheter covers. These items provide warmth and comfort for patients as they undergo surgery, receive treatment, and recover. Home-made blankets and pillows provide a comfort of home during hospital visits and treatments sessions. A selection of pillows has been made to accommodate breast cancer patients, providing support of the upper arm. Chemo-Capes provide comfort and warmth during treatment sessions. Treatment rooms tend to be kept at cool temperatures. With a chemo-cape, a patient can keep warm while maintaining comfortable access to their chemotherapy port. Walker and wheelchair bags can be attached to the front of a walker or wheelchair and provide convenient storage space in transit. Catheter covers provide discretion and privacy to patients, often bringing a sense of ease while in public settings. Rod Swenn, upon visiting family in Canada, he saw his cousins making wig stands for their local cancer center. Rod thought this was a good thing to do and decided that this was what he was going to do for retirement, since his Mother was a cancer patient. After making the first couple of wig stands, he made several attempts to donate them and he happened to come across H.O.P.E. Anyone who comes to H.O.P.E. 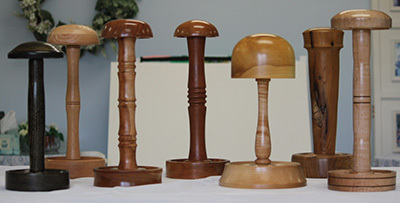 for Cancer Accessories, such as Hats, Wig, Scarves, may receive and hand-turned wooden wig stand from Rod. Not only are they hand-made but made with love. No 2 stands are alike and they are a genuine piece of art! Do you accept donated headgear items? 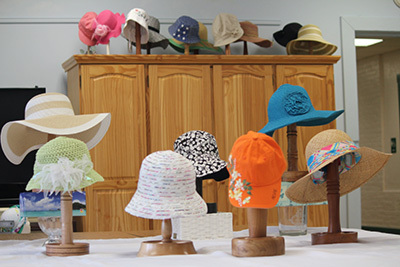 Hats and other headgear are accepted at the office as long as they can be washed and do not showsigns of wear. How does one arrange to receive these items? Any patient interested in viewing our hats, turbans, wigs, or hand-made blankets, pillows or capes can contact the office and we would be so happy to accommodate them. Can someone donate Wrapped With Love Items? Yes, we accept donations of this type with such gratitude. These items are made with love, and we want that love to continue directly to the patient. Anyone interested can find simple patterns, if they don’t have any themselves, on the internet. Contact person or facilitator for this program? Just call the office and Barb or Carol will be happy to help.